For the second assignment in KDC the group needed to control a spaceship and land it on a free rotating Alien Artifact. This was particularly difficult because the artifact didn’t have uniform density, so it would spin seemingly randomly in 3-space. The only feedback we had on the artifact was the relative location of its 8 corners. After observing it briefly, we were able to determine the principal axis of inertial and predict its motion using forward dynamics. Here is a video of our lander approaching and docking with the artifact. Note that while it looks like we just “stick” to the artifact, we are actually using thrusters to stay perfectly adjacent to it without ever making contact. At every timestep in the simulation, we are given the current joint angles and velocities, and we need to return values for torques that we want to apply at each of the two joints to control the arm. Basically, we used PID Control to do some really cool stuff, including having the robot write my signature! Jon was an incredible partner on this assignment and I look forward to working with him again. You can view our final submission here. I can’t wait till the next project! For the final lab assignment in my Robotic Manipulation class, we were challenged to competitively stack cups. We were given six 3 inch tall plastic cups, and were instructed to make a 3-2-1 pyramid out of them, then destroy the pyramid, as quickly as possible. Before we even began working on the project the best team had already done it in only 12 seconds. The robot arm is currently equipped with a descent pneumatic gripper. Two big plastic pads squeeze the cups one at a time to contain them. Stacking cups one at a time is inefficient, but teams were doing it. Nico and I decided that we needed a some mechanical advantage. The biggest design limitation was that the only way to actuate our device would be to integrate with the existing gripper. This limits us to on-off control, which prevents us from picking up all of the cups at once and releasing them strategically. However, the bottom stack doesn’t really need to be picked up, it only needs to be slid across the tabletop. Also, picking up two cups at once for the middle layer saves time as well. The top cup could even be optimized by dragging it into the stacking area initially. If any of these goals could be met, it would give us an advantage over the other teams. In our previous lab, we were able to use the gripper to attach our end effector to the DENSO arm. However, because we rely on the actuation of the gripper to activate our mechanism, we needed an alternate means of attachment. The T-slots on the end of the DENSO arm are the perfect size for a 1/4” nut, which is the standard size for a #4 bolt. Attaching here gave us a reliable fixed reference point. Using the robotics club CNC, I was able to build the 6 parts necessary for the device. The only problem I encountered was bowing and vibration in the middle of the largest piece. Because my piece (11.58”x3.68”) was near the maximum limits of the machine (12”x4”), it was difficult to secure the middle of the stock. All in all, it took about 5 hours of machining to build the entire mechanism, half of which was slow-going CNC time on the largest piece. In the end, we were able to achieve a time of 5 seconds. Nico and I are pleased with the results, and expect to have the fastest time in the class. Robotic Manipulation Clock Lab: Working! After a total of around 4 hours on the robot, Nico and I got the arm to work! We have two modes: one that displays the current time, and one that will count off time from a predefined starting point. Here are some videos of us testing at about 1:10AM on Sunday night. I had to modify the pen and eraser holder a little bit to make it work. I needed to make the drip area fatter, because the fingers don’t actually close all the way. Also, I needed to mount the pen and eraser at a really close angle, because it took two seconds to rotate the tool by 90 degrees, which was unacceptable. By adding a fancy part to the original assembly, I was able to make it all work. 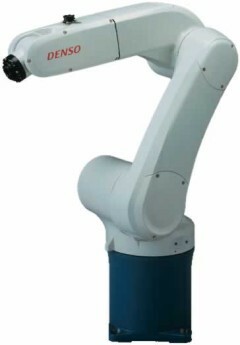 The second lab in my robotic manipulation class involves telling time with the 6-axis denso robot arms. My lab partner Nico Paris and I decided we wanted to tell time by drawing lines on a white board and erasing them. Instead of drawing numbers, we are drawing 9 equally spaced lines radially out from a point. No line translates to “0” and some number of lines corresponds to that digit. There are 6 of these sets of lines, corresponding to two hours digits, two minutes digits, and two seconds digits. In order to draw and erase lines, I got to make a cool tool for the robot to hold. By rotating its last joint by 90 degrees the robot can switch between the pen and eraser. What’s even cooler is the spring built in to the pen part of the assembly to allow for some compliance without totally squishing the pen! Here is a render of the tool, and a cross section to demonstrate the compliance in the pen. Photos and video of the final product in action are forthcoming. We demo the design on October 18th.